While there were tensions over religion, what really began the crisis was taxation which was fueled also by the clash of dynasties in Judaea. The hatred of Roman taxation first emerged during the civil war between Octavian and Marc Antony and Cleopatra. 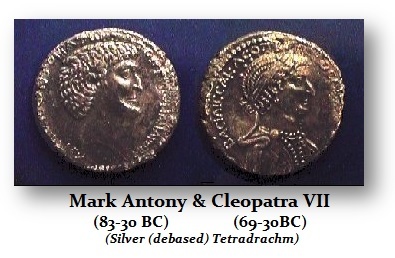 To fund an army, Antony and Cleopatra impose heavy taxation in Judaea. King Herod I the Great (40-4BC) was actually a usurper who eventually overthrew the Hasmonean Dynasty. There was a strong resentment of Herodian rulers by particularly the high priests. There was clearly a Hasmonean-rebellious segment in Judaea. Under King Herod Agrippa I (37-44AD), the king of Judah under the auspices of the Romans, there were inherent attempts of Hasmonean descendants to incite Judah against the Romans. This was the element behind the Zealots who had defended the last Hasmonean King Mattathias Antigonos II (40 – 37 BC). Following, the death of Nero and religion came into play about 2 years after it began. 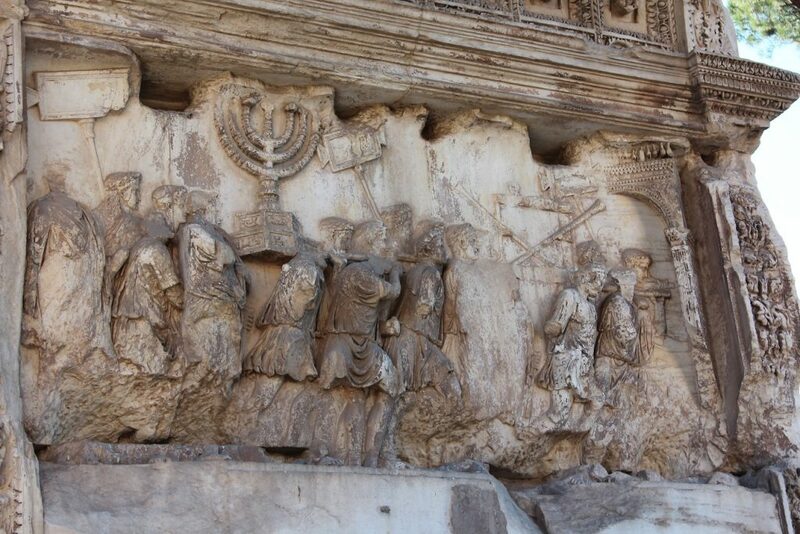 It is true that the rebellion of Judaea began in the year 66 AD, originating in ethnic and religious tensions but Rome had generally allowed every region to keep their own gods. In the case of Judaea, they were not fond of using coins with images of various gods. The crisis truly erupted due to anti-taxation protest that resulted in attacks upon Roman citizens. The Roman governor, at that time, was Gessius Florus. As the rebellion over taxes began, he responded by plundering the Jewish Temple seizing wealth to compensate for the decline in taxation. The following day he arrested numerous senior Jewish figures who were not directly connected to any violence. Meanwhile, on September 22nd, 66AD, Emperor Nero created the Legio I Italica. He also appointed the future emperor Titus Flavius Vespasian legate of the army of Judea and in command of three legions — V Macedonica, X Fretensis, and XV Apollinaris. These actions resulted in justifying a large-scale rebellion which began in October 66AD. The rebels were able to annihilate the Roman garrison (a cohort of Legio III Cyrenaica) in Jerusalem resulting in King Herod Agrippa II and all Roman officials fleeing from Jerusalem for their lives. 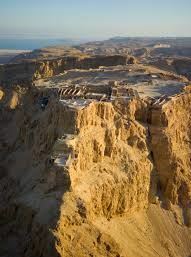 Meanwhile, Sicarii captured the fortress of Masada overlooking the Dead Sea. With the fall of Jerusalem, Cestius Gallus, legate of Syria, marched into Judea and lead a Roman army of 30,000 men to put down the Jewish rebellion. At its core was Legio XII Fulminata, plus 2,000 picked men from the other three Syrian legions, six more cohorts of infantry, four alae of cavalry, and over 14,000 auxiliaries. The auxiliaries were furnished by Rome’s eastern allies, which included Herod Agrippa II and two other client kings, Antiochus IV of Commagene and Sohaemus of Emesa, who lead their forces (largely archers and cavalry) in person. Gallus lead his main force down the coast from Caesarea via Antipatris to Lydda, detaching other units, by land and sea, to neutralize the rebel strongholds at Joppa, Narbata and the Tower of Aphek. With Galilee and the entire Judean coast in his hands, Gallus turned inland and marched on Jerusalem but broke-off the siege in November 66AD. As he withdrew his forces to retire to winter quarters, the Jewish rebels ambushed and defeated him. Some 5,300 Roman troops are killed in the battle. The Jewish rebels now captured his pack animals and his artillery which they used during the next siege by Titus four years later. This was a major victory for the Jewish rebels and it became a major disgrace of the Roman military. The Jewish rebels captured even the eagle standard of Legio XII Fulminata. Gallus abandoned his own troops in disarray and fled for his own life to Syria. 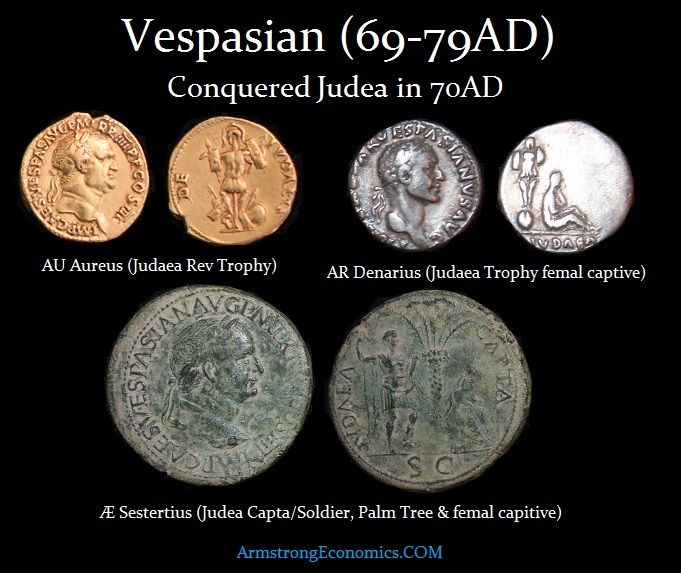 During 66AD, the Jews thus took control of Jerusalem and began to issue their own coins. The Judean Free Government was formed in Jerusalem including former High Priest Ananus ben Ananus, Joseph ben Gurion and Joshua ben Gamla elected as leaders. Yosef ben Matityahu was appointed the rebel commander in Galilee and Eleazar ben Hanania as the commander in Edom. Later, in Jerusalem, an attempt by Menahem ben Yehuda, leader of the Sicarii, to take control of the city failed. He was executed and the remaining Sicarii were ejected from the city. Simon bar Giora, a peasant leader, was also expelled by the new government. Vespasian was given the task by Nero of crushing the rebellion in Judaea province. His son Titus was appointed as second-in-command. Vespasian invaded Galilee in the fall of 67AD. He avoided a direct attack on the reinforced city of Jerusalem. Instead, Vespasian launched a directed campaign to crush rebel strongholds and punish the population. Within several months Vespasian and his son Titus, also a future emperor, took over the major Jewish strongholds of Galilee and finally overran Jodapatha, which was under the command of Yosef ben Matitiyahu, as well as subdued Tarichaea, which brought an end to the war in Galilee. With the death of Nero in 68AD, Rome moved into a Civil War. Vespasian became the rival general to ain over Otho and Vitellius. Now the Judea situation was a matter of critical importance. Vespasian became emperor in 69AD and the defeat of the Jewish Revolt was critical for if they succeeded, then other provinces would rally against Rome as well. The first Jewish coins boasted the slogan: “For the Freedom of Zion.” The Jewish War for Independence last 4 years covering the period of 66-70AD until the conquest of Jerusalem. Recently, a bronze coin was discovered in Israel from the fourth year of the failed rebellion against Rome which reflected the change in attitudes. 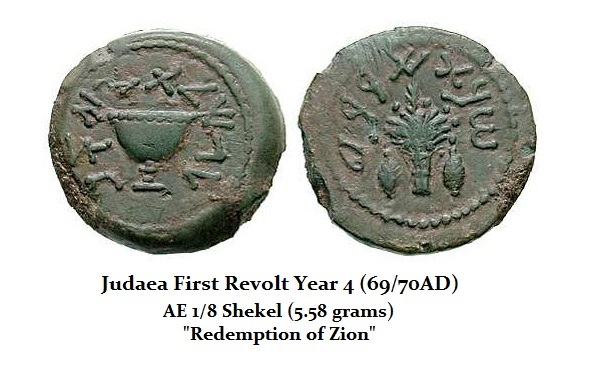 The coins of Year 4 saw a change in the slogan to “For the Redemption of Zion.” The Temple was sacked in 70AD and the clean-up skirmishes followed which took several years. The historian Josephus tells us of the last stand at Masada which took place around 73-74 AD (of which they made a classic mini-series). Year 1 (66/67 CE) Jewish shekels and half shekels are scarce, year 2 (67/68 CE) shekels and half shekels and year 3 (68/69 CE) shekels and half shekels are relatively common, year 4 (69/70 CE) shekels and half shekels and year 5 (70 CE) shekels are extremely rare. Virtually EVERY revolution throughout history appears to emerge from a tax rebellion. It will often expand into ethnic or religious slogans, but at the core, it is always taxation. The American revolution was the class – No Taxation Without Representation. Yet the greed of politicians inevitably leads to their own destruction for they cannot resist spending other people’s money.